Renee Richard makes a lot of news-12 pages worth in fact, as the local newspaper has a spread on her. 2,300 come out for the early Stove-Bueno match. Over 4,000 for the finals. Billie Jean King once again beats Martina Navratilova in a tight quarterfinal, breaking at 5-4 for the match. Her wins over Fromholtz and Stove were easier. The win over Stove lasted less than an hour. King declared she was "fully recovered and back to her best for again." King moved up to 4th on the Colgate list. Last edited by Rollo; Jan 14th, 2017 at 02:31 AM. King wins her third straight event. An early test came vs Kristien Shaw, a 2 hr 20 marathon. King's win streak looked done for in the semis, as Betty Stove had racked up a 4-1 third set lead over a disoriented Billie Jean. Somehow King gritted it out, exclaiming later, "My attitude stunk. My concentration kept fading in and out and I couldn't force myself to take control." Going into the Colgate Masters King is the hottest player on the circuit. Top seed Martina Navratilova withdrew due to a sore shoulder. Last edited by Rollo; Mar 25th, 2018 at 04:08 AM. Format: Round robin format with winners from both groups in the final. *Evert (2-1) advances to final over Wade (also 2-1) due to thier head to head encounter in the round robin. *King advances to final with 3-0 record. 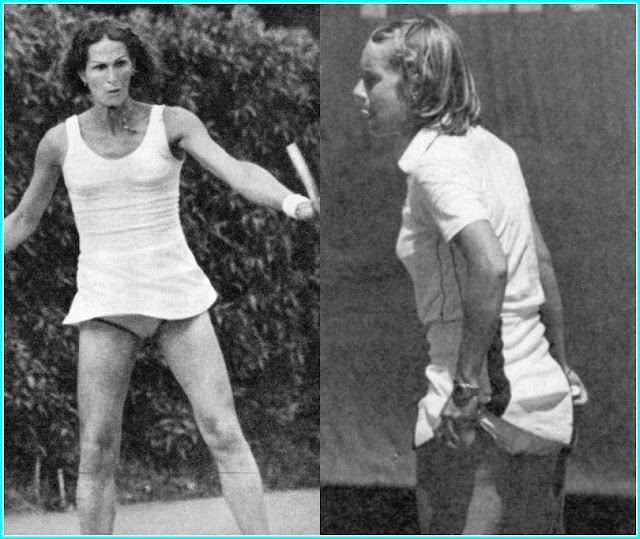 FI: Francoise Durr/Virginia Wade d. ???? The Red Group is quite loaded with the consensus top three players for the year. Fromholtz surprises Evert, but Chrissie then beats Navratilova, Wade and King to complete her year of supremacy. At the year’s end, King is playing like the 2nd best player in the world and she defeats Reid in a 3 setter to claim the Blue Group. The Evert-Wade encounter is the match of the event. Wade jumps out to an early lead. In the second set she is so contentious over a line call that the crowd switches sides and supports Evert. Ginny said afterwards that "I cooked my own goose". Evert had a Cheshire cat-like grin on her face, relishing victory. 2R: Viviana Gonzalez d. ???? 2R: Betsy Nagelson (US) d. ???? 2R: Ivanna Madruga [Q] d. Renate Tomanova (Cz) ???? QF: Nagelson (US) d. ???? 16 year old Madruga storms into the final as a qualifier. Her game is a curious mix of high bounding topsin mixed in with drop shots. Richards uses power to overcome a relative lack of mobility due to her age (42). Madruga said afterwards: "I felt that I was playing against a man". *Gonzalez also listed as Gonzalez Loccicero in the NYT. Above and below: Blonde Ivana Madruga and winner Renee Richards at the River Plata Championships. In other news of the week, a girl is born to Margaret Court on November 4th. 7,351 come out on night one. Barker, who had been out 3 weeks from anemia, can't put up much of a fight. Wade more than makes up for it though, as she hurls herself at the net. It's nip and tuck all the way. Virginia hits an ace to get to 3-4 in the tiebreak, but errors and Evert passing shots end an entertaining match. 4,814 attend the second night. The US clinches the Cup by taking both matches for a 4-0 lead. A sellout of 11,317 comes out on the star-studded third night. Last edited by Rollo; Jul 9th, 2014 at 07:47 PM. 9,000 show for the quarters, the biggest crowd of the week. More might have come for the last two rounds, both affected by heat and rain. Rain delayed the event-the women's final played on a Monday. 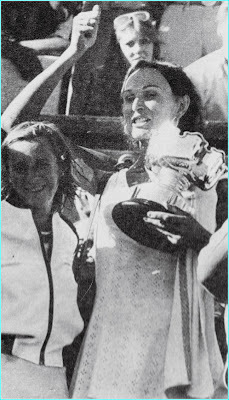 Temps were torrid-120 F in the semis where Wendy Turnbull upset Sue Barker. Manwhile Goolagong dismantled Stove. Evonne after her semi win: "I didn't expect to win last week in Sydney and I'm just as surprised to be in the final this time. But if you will excuse the expression, Betty played bloody awful." Venue: (in Tokyo): Aoyama Gakuen Gym. Prize Money=$195,000 combined with men. *Note: First round played in Kobe. A $20,000 first prize money haul for Billie Jean King. Last edited by Rollo; Jan 14th, 2017 at 09:13 PM. Boshoff, only 21, announces her retirement at the start of te week and then wins the tournament! Ranked #50, she just missed being seeded. Victory is especially sweet as she blew a 5-0 40-0 led the previous year vs Val Ziegenfuss. Linky will study Computer Science at Port Elizabeth University. Nancy Richey sheds tears when a shot 6 inches long isn't called in the tiebreak. Nancy was up 4-3 in the tiebreak when she was robbed, and was so upset she never won another point in the tiebreak and meekly went out. The men's and ladies finals were held on Tuesday night. Last edited by Rollo; Jan 10th, 2018 at 06:13 PM. This event is a joint effort at a rare women's only in Europe. Sponsored by Wimbledon referee Mike Gibson and King Enterprises, which is run by Billie Jean's husband Larry. Rosie Casals and Laura DuPont are late withdrawals. Virginia Wade is feted royally by the British Press, this being her first return to Britain since winning Wimbledon. She is also on television in a program called "This is Your Life." Ginny play throughout the week is spotty, perhaps drained by the emotion and the end of the season. Billie Jean King survived Betty Stove yet again in the semis. The tall Dutch woman has pushed the Old lady to 3 sets several times this season but can't put her away. The trend continues here, as a missed volley and a double fault aid King on taking the final set 6-3. Wade puts up a fight in a final that is one-sided-going all Billie Jean Kings way. King ends the year winning the last 27 of her 28 matches. The lone check against her is losing to Chris Evert at the Colgate Masters. The final is the only sell-out of the week with 2,000 fans. The event is not continued the next year. Results provided by Declan and p 279 of Dolan. Exact dates unknown-near the dates for the South African Open. Collectively these events made up the Suger Circuit. Last edited by Rollo; Jan 14th, 2017 at 09:42 PM. Former World #1 Darlene Hard marries Richard Harold Waggoner late in the year. The December 1977 version of the Australian Open starts on December 19th and ends January 1, 1978. Consequently the results may be found in the 1978 thread. Last edited by Rollo; Jan 14th, 2017 at 08:40 PM. Last edited by Rollo; May 4th, 2014 at 01:09 PM. Last edited by Rollo; May 4th, 2014 at 01:10 PM. Note: Some of the above Dutch players were included under their married names in the rankings for 1976 listed in the BP "World of Tennis" Yearbook (1977). Last edited by Rollo; May 4th, 2014 at 01:12 PM. Last edited by Rollo; May 4th, 2014 at 01:13 PM. Your work is much appreciated Declan-thanks! There is a lot of work still to be done, but in the main the outline of 1977 (which events were held in week order from January to December) is up. Most events have some information for later rounds.